I’m passionate about art. And I’m sensitive to a world with too much ‘stuff.’As a fiber artist—smitten with color, texture, and endless combinations thereof—I love making things. As someone who cares about environmental issues and the problems of a society with ‘too much stuff,’ I’m also committed to a ‘reduce, reuse and recycle’ ethic. I got the idea to work with plastic a few years ago, experimenting with all of mysaved shopping bags. 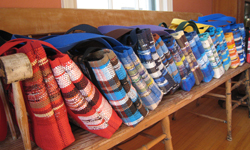 Now I’m completely hooked—happy about the bags I’m making and happy to be reducing stuff in our landfills. As I began working with plastic, I quickly realized that its strength, flexibility and ability to hold color make it a perfect material for the loom. With a snip and a cut, plastic is transformed; color and printing appear at seemingly random intervals. 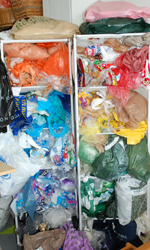 I source my plastic from my own use, a wide network of friends who collect bags for me, and bag recycling bins; I also use other ‘single-use’ items such as plastic party tablecloths. The bags I make are one small way to repurpose something unwanted into something that is both useful and beautiful.